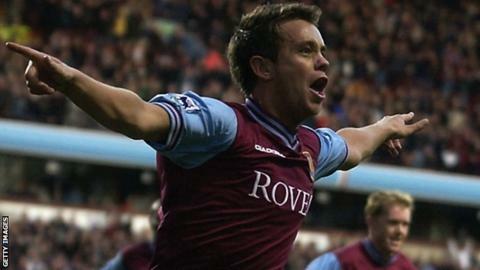 Ex-England and Aston Villa midfielder Lee Hendrie claims someone at a Devon football club has falsified transfer documents purporting to be from him. Tavistock AFC of the South West Peninsula League say they are investigating after they 'signed' Hendrie on 31 March. "It's completely ludicrous. I can't understand where this paperwork's come from," Hendrie told BBC Sport. Some of the club's players met Hendrie at a five-a-side tournament last month. "They asked if I would sign and they'd get me a helicopter to come down and play. It was just a bit of banter, and that was it really. "They could end up in a little bit of trouble because I certainly haven't signed any papers saying I've signed for them. "The only thing I can think of was I was signing autographs on the night as there were a lot of ex-pros there. "Someone's tried to forge my signature - that's the only thing I can think of that someone's done," Hendrie added. The South West Peninsula League is a semi-professional league for Devon and Cornwall and its transfer deadline was 31 March. A form purporting to have come from the 36-year-old, who also played for Stoke,Sheffield United,Derby and Bradford, was faxed to the league secretary that evening. "We've got 52 clubs in the league and lots of clubs signing players to make sure they can get through to the end of the season," said league secretary Phil Hiscox. "Amongst those faxed across were a couple registering for Tavistock, of which one was Lee Hendrie, with an address in Staffordshire and a date of birth matching the date of birth that matched the Lee Hendrie that has played for Aston Villa and England. "It was considered slightly exceptional because of his pedigree but no more so than several players who do feature in the Peninsula League. "It was just regarded as a bit of a coup really and processed in the normal way." "I'd heard a rumour a week ago that he was about to, or had signed for them, but it was only on deadline day that I received the form," he said. "But it was something I was aware of with a distinct possibility. "It's all a bit immature and childish to pretend a player wants to register when he indeed hasn't done so." Tavistock chairman Chris Fenner says he is investigating the circumstances in which Hendrie's 'transfer' came about. Earlier on Monday he told BBC Sport: "A couple of our players took part in a work football tournament in Manchester last month. "Each team was given an ex-professional. He [Hendrie] wasn't even in their team. But in the bar afterwards they bumped into Lee, got chatting, and somehow he said he'd be interested in coming down to Tavistock." Tavistock get crowds that rarely touch three figures, a far cry from the days when Hendrie used to treat over 40,000 fans to his skills at Villa Park. After leaving Bradford City in 2010 he played for Indonesian side Bandung before slipping into non-league football where he played for Daventry Town, Kidderminster, Tamworth and Corby Town. He now plays for Nottinghamshire side Basford United, who are third in the Northern Counties East League Premier Division. "Imagine if anything did come of it, that it has gone into a league and it causes any sort of friction with my club," Hendrie said. "We're pushing to get promotion, so if they got points deducted I'd be absolutely fuming."